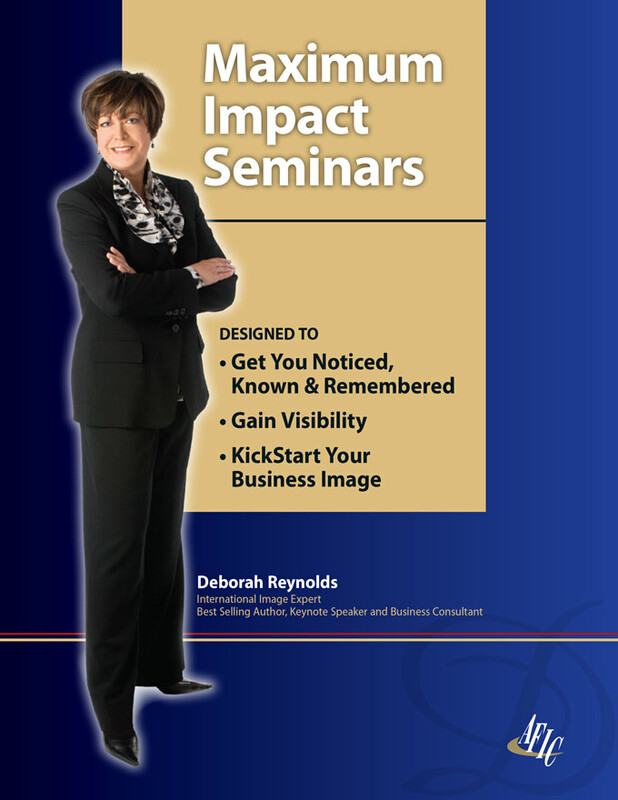 Maximum Impact Seminars | Deborah Reynolds | About Face Image Consulting, Inc.
It’s all about the RESULTS. If you want your team to take the right action, if you want maximum results then you must provide personal development designed to facilitate limitless potential. You need to think differently. It starts from the inside out. It’s time to create Maximum Impact in your life and business. It’s time to Change, Renew, Empower and Transform yourself and your team! Your team needs the best training and development, the best seminars and the best tools to keep them engaged, motivated and productive. From Leadership Training, Communications Skills, Emotional Intelligence, Time Management, and Project Management practices, mastering these will help keep your team sharp so they can meet any challenge head on. Team development and growth will support company and business growth. Everything we acquire in life is attained with and through other people. The people in your organization are your most valuable assets. Develop your team and you succeed. Empower Your Team… increase your productivity… increase your efficiency… maximize your effectiveness… increase your return on investment… retain customer loyalty… improve customer relations… exceed your business goals. All our programs are customized for you and your needs and to maximize results. Keynote Speaking to entertain, engage, energize, motivate, and inspire. Whether it is a Private Retreat, Conference, AGM, or other event, we are here to serve. Business is tough. When you are seeking sound advice to assist your team to the next level, experience is key. A consultation with our office will ensure the right trusted advisor can assist you. It’s all about the result. We guarantee outstanding results.